Will it turn on all eight-cores? Evolution is typically a positive occurrence, and in the case of SoCs, usually means we're in for more primed performance. Samsung is teasing such a genetic jump today, posting via the @SamsungExynos Twitter account that a new version of its eight-core processor is on the way. The messaging was clear: "A new Exynos 5 Octa is coming next week!" so no need to go Sherlock Holmes on this one. Here's more: "Year after year, we strive to improve the power and performance of our Exynos processors. 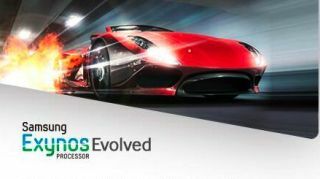 Now it's time for the next step in our evolution - a more powerful, enhanced Exynos 5 Octa!" A brand-less sports car rips above these lines with fire (fire!) lapping behind it, so clearly the message is grab a hose because this chip is about to roar. While the first Exynos 5 Octa has all the markings of a blazing processor - especially as it brags on possessing eight-cores - not all of thecores are raring at the same time. We may be in for some clock boosts to the Octa's current processors, four Cortex-A15s hitting 1.6GHz and four Cortex-A7s topping 1.2GHz, or perhaps the Exynos team is plotting further LTE support. Yet another option is that Samsung heard what MediaTek, a Taiwanese semiconductor maker, is up to and decided it better provide an update pronto. A leaked MediaTek document picked up earlier this month indicated that the company was fast-tracking its own octo-core chip in the hopes of pushing it out by November. This chip, the Cortex-A7 MT6592, would have all eight cores jumping simultaneously and not, like the Octa, switch between processors depending on work load. Though the MT6592 reportedly runs at less GHz than Qualcomm's Snapdragon 800 (2GHz vs. 2.2Ghz), it's said to be considerably cheaper than that next-gen chip. Phones gifted with the authentic MediaTek offering are expected by early 2014. Going Mini meant slipping processor size for HTC.